Excellent condition; new screen; grandson was very pleased!!! Definite five star Game Boy! The console works impeccably, the sound can be switched on or off, all of the buttons function well and do not get stuck while playing. The body is in VERY good condition, the screen is not backlit but IS spanking new making it a joy to have and play!! My Game Boy, Works Perfectly, With The, Included Batteries, And All My Games, Work On, It Too. I was surprised to see that it is in very good condition considering it's an old and used gaming system. The screen has been replaced so no scratches whatsover. The sound is still great. The buttons work fine. The front part looks aesthetically good, a "like new" appearance. On the back is where it's obvious that it is not brand new, well bec. it's not. Overall, I am happy and my son is happy. Thank you. 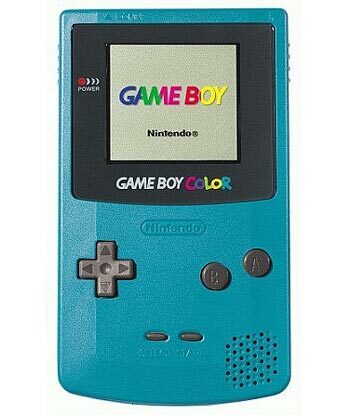 When I was a kid, I owned a teal Gameboy Color. It's great to get a new one. It wasn't in perfect condition, but for how old the system is, not bad at all. Gameboy Color works great. No problems. Gameboy in good condition and I am very glad I ordered one. When I have free time and need a few moments to myself it is a great relaxing gadget to have around. The game works perfectly. I have ordered several times from Lukie Games and never disappointed. Its hard to find a website for old games that is easy to use and has it all. Will definitely keep ordering from Lukie Games! 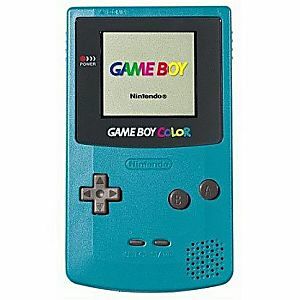 I have been "looking" around at getting a gameboy for a couple years now but have always decided against it because of how expensive I was finding them for. I found this at just the right time for me to want to get back to my childhood ways of playing games and Lukie Games really came through with a perfect product for the right price! I am really happy with it. At first I was a little mad because I had problems with the games and I tought that it had a light in the screen but I was wrong and now I am happy.After speaking with an employee who was very helpful and answered all my questions, I learned that GBC were not that ''modern'' at the time. Kind of sad that you can't play in the dark but the screen is brand new and the quality is perfect.The battery case was a little bit dirty, but I know it can be hard to reach there. Anyway, very happy in the end and it works perfectly. Thank you! Bought this as a gift for my daughter, she loves it and it works great, it is in excellent condition. I thought there was a scratch on the screen. I contacted Lukie, they got back to me right away. Told me there is a protective film over the screen and maybe that was scratched and not the screen, but if I was still having a problem to let them know and I could return the Game Boy. They were right it was just the protect film that was scratched. Thank you for the great service Lukie and the great Game Boy! This was a great purchase! System was in great condition when delivered. Allowed me to relive childhood memories! Thanks lukie games! My game-boy came in today. Very happy with it. New screen and new battery's. The price of the system is very nice. Very pleased with this product! One of the best priced GBCs that I have been able to find, which was worth every cent. The system looks like as if it's fairly new and is in great condition, the games that I have also play great on it. Highly recommended!